J. G. Martins received an engineering degree in telecommunications. He was a professor of physics and other scientific subjects at a university, prior to devoting himself to his true passion - creating and telling stories. 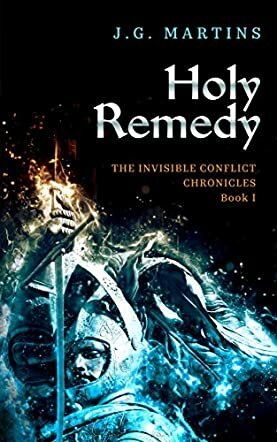 Holy Remedy by J.G. Martins is Book One in The Invisible Conflict Chronicles, an epic tale with a stunning historical setting around the 13th century. It is a period when the quest for power and superstitious beliefs are very strong. The Magyars have barely recovering from the invasion by the Mongols, working hard to rebuild their kingdom. It is at this time that a deadly disease hits the Baron Levente, the regent of Eger. For Bishop Konrád, it’s a curse. Unless a cure is found quickly, the Baron will die. A cure has been found, but it is located in the treacherous deeps of the Bükk Mountains and only one man can beat the odds to reach there, the Baron’s own pupil and knight, Rodger Clement. Can he make it to the heart of the mountain and be back in time to save his master? There is a lot to enjoy in Holy Remedy, a tale set against the backdrop of one of Europe’s great cultural crossroads and melting pots, Hungary, with lush vegetation and strange beliefs. I couldn’t help thinking about the witch-hunting that took place in this land hundreds of years ago. The story features great and compelling characters and a lot of action and fighting. The plot is well conceived and readers are treated to many twists and surprises as they turn the pages. J.G. Martins writes beautiful dialogues and they play a powerful role in enhancing plot and character development. The dialogue flows naturally and merges with the wonderful descriptions to create great beauty in the work. This is a novel with great historical elements, a gripping plot and a huge conflict. Martins definitely takes readers to an historic age and across dangerous lands.